Why be a Mobile Website Reseller? Whether you‘re a local digital agency or a sprouting entrepreneur, brick&mobile enables you to deliver premium mobile websites that help drive revenue for you and your clients at a lower cost than ever before. With our Pay-As-You-Grow mobile reseller solutions, our team of mobile experts are ready to help deliver the best mobile experience and added value for your clients. brick&mobile’s powerful mobile platform, combined with our turn-key marketing material blueprints and proven sales strategy training, will get you selling mobile websites in no time. 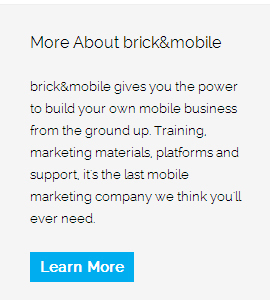 brick&mobile offers flexible pay-as-you-grow Mobile CMS packages that fit your needs. It is the “secret formula” that enables you to create professional-looking premium mobile websites in hours, not weeks. Each Mobile CMS website can serve a single client, and can be sold directly by you at any price you choose! Build in hours, sell for thousands. Our Mobile CMS Resellers typically resell packages to their clients for anywhere between $500 and $2000 per mobile website, in addition to monthly hosting and change fees of $80 to $300+ (varies by client). Mobile websites help open doors, and allow you to offer a premium service that most others don‘t. Start with a mobile website, them move up to our advanced upselling options with SMS Marketing and QR codes. With our flat monthly fees you have no other costs to worry about. No designers. No developers. No expensive WordPress themes to buy. Never have to upgrade a plugin. No hidden costs. Nothing to worry about.